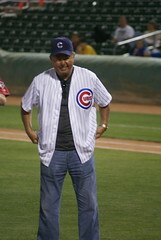 Ron Santo at "Fergie and Friends" baseball game, 2009. Photo by Barbara Moore via Flickr/Creative Commons. Former Chicago Cubs third baseman and Seattle native Ron Santo has been elected to the Baseball Hall of Fame by the veterans’ committee. Southeast Seattleites may be forgiven for feeling some extra pride at this long-overdue achievement; Santo, a three-sport star (football, baseball, and basketball) at Franklin High School, grew up in the nearby Italian “garlic gulch,” within sight of the lights of Sicks’ Stadium (which was located on the current site of Lowe’s, at Rainier and McClellan). As a boy, Santo worked for the Seattle Rainiers in various roles including bat boy and clubhouse helper. He signed with the Cubs out of high school for a $20,000 signing bonus, and went on to a career as a nine-time All-Star, with five Gold Gloves and 342 home runs. During much of Santo’s career, he kept secret from the public that he had been diagnosed with juvenile diabetes as a teenager. In later years, he worked to raise funds for the Juvenile Diabetes Research Foundation, helping raise more than $60 million for research through the annual Ron Santo Walk to Cure Diabetes. Santo died on December 2, 2010 at the age of 70 from complications of bladder cancer. See more about Santo at SportsPress NW, the Seattle Times, and ESPN. 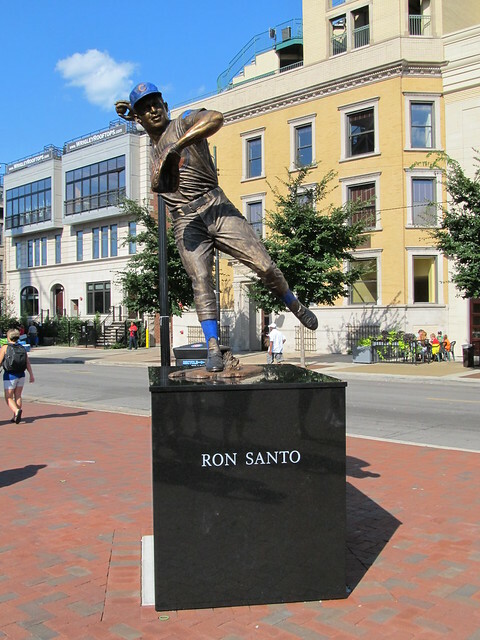 Ron Santo is memorialized by this Chicago statue. Photo by Zol87 via Flickr/Creative Commons.